Python is most definitely not a “pure functional programming language”; side effects are widespread in most Python programs; variables are frequently rebound, mutable data collections often change contents, and I/O is freely interleaved with computation. However, Python is a multi-paradigm language that makes functional programming easy to do when desired, and easy to mix with other programming styles. Many programs in Python can benefit from developing them in a more functional style. 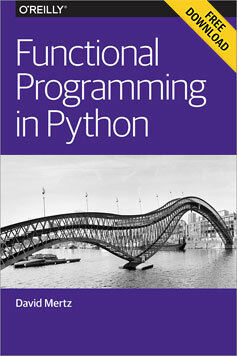 Functional Programming in Python provides readers with an excellent introduction to how to write Python in a more functional style, and when doing so make projects easier to create and maintain.